Frugal & Fabulous: Review: Peeps Valentine's Day Treats! Review: Peeps Valentine's Day Treats! Back in December I shared with you that we love Peeps! Then we tried Peeps dipped in Chocolate... consider our lives changed!!! 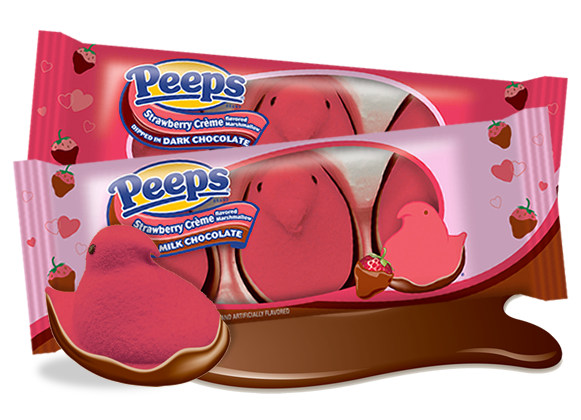 One of our other favorites, is the individually wrapped Peeps Chocolate Covered Raspberry Hearts. These were similar to the chocolate dipped strawberry creme chicks but with more of a chocolate kick. Each bite is of raspberry marshmallow and chocolate combined into one perfectly sweet treat. So delicious! These retail for under $1, but looks and taste much more expensive! 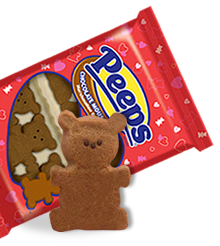 We also like the Peeps Chocolate Mousse Marshmallow Bears - these are a traditional marshmallow Peep but with a chocolate flavor twist. It was a nice sweet treat - and would look so cute on top of a cup of hot cocoa! Not into chocolate? 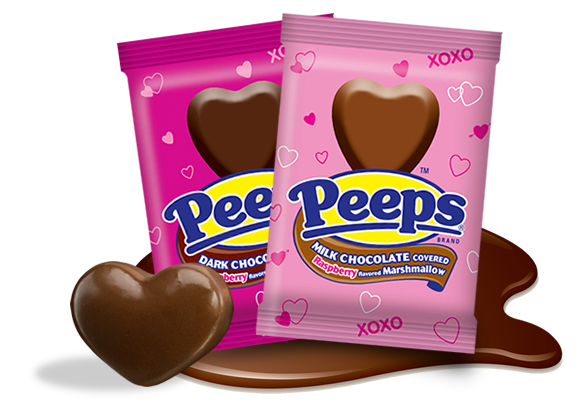 Try the Peeps Marshmallow hearts! These fluffy, pink sugared hearts are your quintessential Peep variety. Pastel & sweet, and a perfect treat! We were thrilled by all of Peeps Valentine's Day Selections - I also love that the different shapes, flavors and styles for each holiday are a perfect way to dress up your holiday treats. 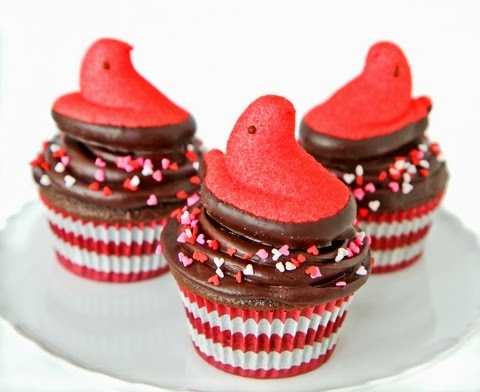 Why not add a peep to your cupcakes (as shown below) or skewer a bunch of peeps and make a beautiful (and delicious) Valentine's Day bouquet or centerpiece! How cute would that look for a party or special dinner at home?! Valentine's Day Peeps are a new and delicious treat ! Why not skip the traditional box of chocolates and try something new?! I have seen these in many grocery & drugstores this year, and I may have to pick up a couple more before the holiday is over!